I love this one. 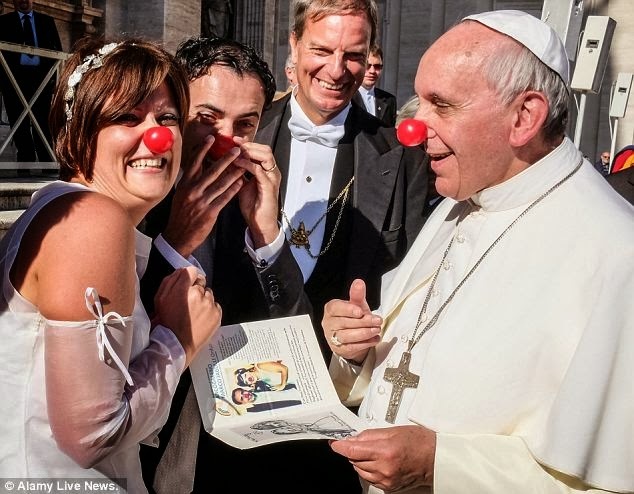 Showing support for a charity that uses clowns to cheer up sick children, Pope Francis popped on a red nose. You've got to love the pope going all Patch Adams. Love should smile. Love sometimes means being silly. Just because I'm a snarky guy who's kind of a jerk at heart I'll say the biggest difference between the Pope and Patch Adams is that people will actually see this picture. Bam. I have read that conservative Catholics feel "left out" by Pope Francis and his mannerisms. Fear not, for he is the Vicar of Christ on earth and his different approach to his Office does not mean that he is able or willing to change the Church into a liberal institution. Remember, the Holy Spirit has the guiding hand in the dealings of the Papacy. Peace and God bless. I'm sorry, but when I see him do stuff like this, it demeans the dignity of his office. Would Jesus or Peter wear a red clown nose? I doubt it. In Britain, "red-nose" day for "children's" charities are much associated with secularist, modernist, anti-traditional-morality organisations. I'm about as conservative as they come, and I don't feel left out a bit by Pope Francis. He is a man with a warm heart. What Ellen said. I'm not a big fan of his Ars Celebrandi, however...I'm a huge fan of his repeated and open loving the sinner while hating the sin. Sometimes loving someone means being willing to look silly to make them smile when they are down. Papa Francis is leading from the front on that too. The Church isn't about having the warm fuzzies for the pope, or your bishop or priest for that matter. It's about following Christ, to the best of our ability, which sometimes encompasses things we don't know we can do.